Guys! It's here again! Our Cooks in The Kitchen (Round Two) is here! Holy cow friends, time is flying by. I can't believe we're already on month 2! How was this month's ingredient for you all? Did you enjoy it? Or was it a total trial and error type thing?? I was super excited that this month's challenge was limes because for some reason I am so incredibly obsessed with all things lime and mint right now. Its the weirdest thing. I literally bought a bag of each the other day and have used it in every single thing I consume. Even in my water! Lime Mint water- get on it! Anyway, back to this month's dishes! First off, let me start by virtually high-fiving Miss Samantha for her amazing looking dish! How yummy does that salmon look??? You can check out her recipe here! This month, I decided to step outside of my baking box and venture into savory cooking! Limes are so versatile that way! 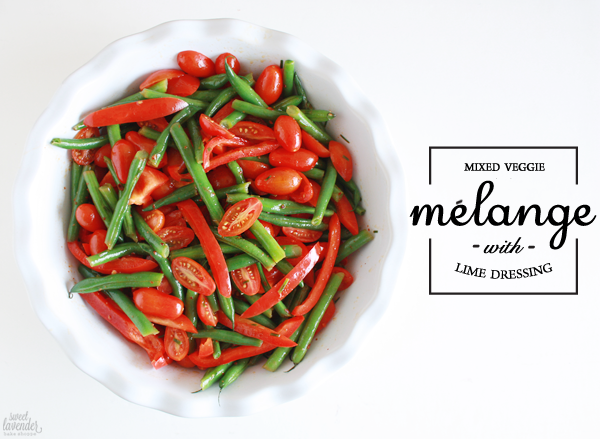 So, for our lime ingredient challenge, I chose to make a veggie mélange. 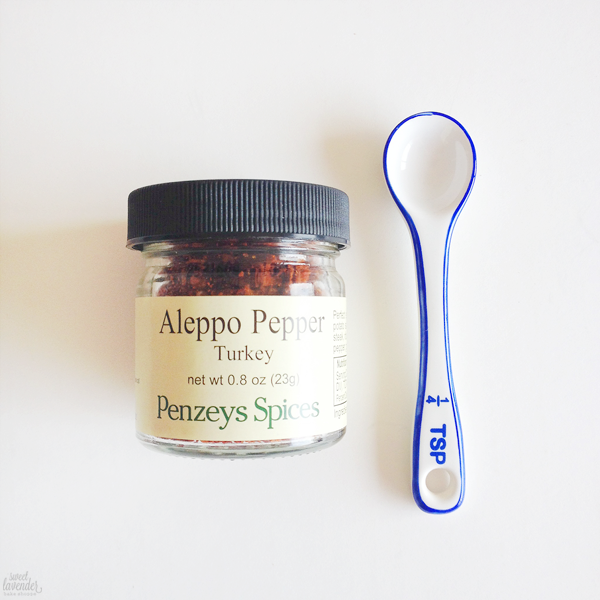 In addition to limes, I'm also using something most people probably haven't heard of or used- Aleppo Pepper flakes. This stuff is extremely delicious, if you are a chile fan. It's not as hot as your standard chile flake, slightly sweeter and tarter actually, and very flavorful. Has a sort of ancho chile flavor, to me. It reminds me of chile I used to eat on random street foods back when I was younger. I bought mine at Penzeys, but if you see it elsewhere, snag it! So good! Don't have Aleppo Pepper? No sweat, just use your standard red chile flake. Make sure to adjust the amount you use, accordingly. Depending on what type of chile your flakes are made from, the heat could be more or less vibrant. Taste as you go. For printable recipe, click here. 1. Cut bell pepper flesh away from it's seeds and stem, and slice flesh into strips. Add to a large bowl. 2. Cut cherry or grape tomatoes in half and add to bowl with bell pepper. 3. Next, add your blanched and cooled haricot verts to your mixing bowl. Toss everything together gently. 4. In a smaller bowl, whisk together your olive oil, lime juice, sea salt, chives, and aleppo pepper until completely combined. If you're a lover of heat, feel free to add more than 1/4 teaspoon! If you aren't a fan, I'd suggest starting with a few pinches and working your way up to 1/8 of a teaspoon. Remember, the chile will become slightly hotter as it sits and marries with the rest of the dressing. 5. Add dressing to your bowl of veggies and toss well to coat. Allow salad to sit on the counter for at least 1 hour to marinate and marry together, tossing every so often. This is such a great picnic or party side dish as it does not include any ingredients that will spoil if out at room temperature for a while! Sweetness! 1. Link-Up your Cooks in the Kitchen post below. Please link to the post and not your home page. 2. Be encouraging. Comment on the post before you and tell them how awesome they are! So fun! I loved April's challenge, didn't you?? If you didn't have a chance to link up with us this month, no sweat friend! We have another challenge coming your way in May! Special ingredient: Spinach! Yep, spinach! 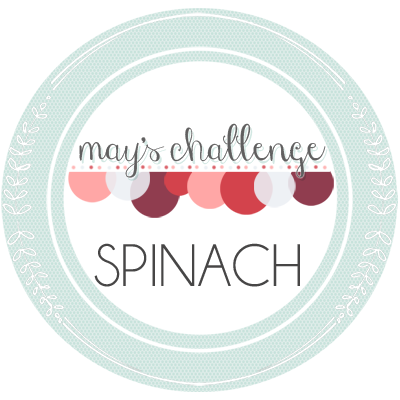 The iron filled, leafy green is May's challenge! Get your thinking caps on and get to cooking (or baking?)! If you are indeed participating in our challenge, would you be so kind as to grab a button/ badge and display it on your blog for all to see? Yummmm! I'm always looking for new ways to get more veggies in my diet. Pinning this one for the future! Hooray! So hope you do! It's so easy to make and literally just sits out getting better and better! This looks so delicious and healthy! Can't wait to link up next month! I totally dropped the ball on my lime pound cake that I planned to make. Anyways, thanks for sharing this recipe! I love this link-up. Lime pound cake?!? Oh man that would have been yummy! Can't wait to see what you do with spinach! Seriously! CAN'T WAIT FOR SPINACH! I love reading this link-up even though I don't participate (yet). I'm ALWAYS looking for new ways to make salmon. It's soo good for you, but I am usually not a fish person. I'm excited to try both of these recipes! plus the ones that are linked up. mmm.. This is such a cool link-up - glad I came across your blog through the A Harvest of Blessing link-up! Your recipes from this month look wonderful - I agree I love limes! Hi! Hi! So glad you stopped by and said hello! Ooh, I'll have to try those pepper flakes, I know Jared would love them! They are so addicting. If he's a chile flake lover, he'll totally dig these.